Accepting neo-Fisherism is a 12-stage program. The first stage is admitting you have a problem. The twelfth stage is helping others to admit that they have a problem too. Going from stage one to stage twelve may be a tough battle - many could temporarily fall off the wagon. But take it one day at a time. Most people, for example Larry Summers, are still at stage one. In this video, about two minutes in, after the jokes, Summers says that neo-Fisherism is most likely to be remembered as a confusion. So, if the problem is only confusion, I would like to help him out. Neo-Fisherian Folk Theorem: Every mainstream macroeconomic monetary model has neo-Fisherian properties. That's just a Phillips curve, with b >0 determined by the degree of price stickiness. In the underlying model, some fraction of firms is constrained to set prices to the average price from last period. Thus, there's no expectations term in the Phillips curve, as there's no forward-looking pricing. That makes the model easy to solve. So, you can see why people think this type of model is a foundation for conventional central banking ideas. If inflation expectations are "anchored," which I guess means exogenous, on the right-hand side of the equation, then an increase in the current nominal interest rate would have to imply that the current inflation rate goes down. Indeed, if the central banker experiments, by choosing the nominal interest rate each period at random, then he or she will observe a negative correlation between inflation and nominal interest rates, which would tend to confirm conventional beliefs. So, what "anchors" inflation and inflation expectations in the long run is the long run nominal interest rate. And then the Phillips curve determines output. That's the first Neo-Fisherian property of this standard model. Next, from the difference equation, (4), if the nominal interest rate is a constant R forever, then there is a continuum of equilibria, indexed by the initial inflation rate, and they all converge to a unique steady state, which is given by (6) and (7). To see this, start with any initial pi, and solve (4) forward. So, we know that the long run is Fisherian. But what about the short run? We'll consider the transition to a higher nominal interest rate. In the figure, the nominal interest rate is constant until period T, and then it increases permanently, forever. In the figure, D1 is the difference equation (4) with a lower nominal interest rate; D2 is (4) with a higher nominal interest rate. We'll suppose that everyone perfectly anticipates the interest rate increase from the beginning of time. Again, there are many equilibria, and they all ultimately converge to point B, but every equilibrium has the property that, given the initial condition, inflation will be higher at every date than it otherwise would have been without the increase in the nominal interest rate. A straightforward case is the one where the equilibrium is at A until period T, in which case the inflation rate increases monotonically, as shown, to a higher steady state inflation rate. Inflation never goes down in response to a permanent increase in the nominal interest rate. That's consistent with what John Cochrane finds in a related model. Monetary policy makers should be seeking to ease, not tighten. Instead of satisfying a phantom need to “normalize” rates, the Fed should do what’s needed to get employment and inflation back to normal. Apparently he's thinking about some other model, as the one he constructed tells us the opposite. monetary policy shocks, while output is then pinned down by the New-Keynesian Phillips curve. The real rate largely only reflects consumption smoothing. In fact, declines in output and inflation are consistent with a decline, increase, or no change in the ex-ante real rate. In the next figure, A is the intended steady state in which the central bank achieves its inflation target, and that is one equilibrium. But there are many equilibria for which the initial inflation rate is greater than -r and smaller than the inflation target, and all of these equilibria (like the one depicted) converge to the zero lower bound (ZLB), where the central banker gets stuck, with an inflation rate permanently lower than the target. Potentially, there could be equilibria with an initial inflation rate higher than the inflation target, which have the property that inflation increases forever. But in this model, that also implies that output increases without bound, which presumably is not feasible. Rules with -1 < d < 1 all have the property that there are multiple equilibria, but these equilibria all converge to the inflation target - there's a unique steady state in those cases. 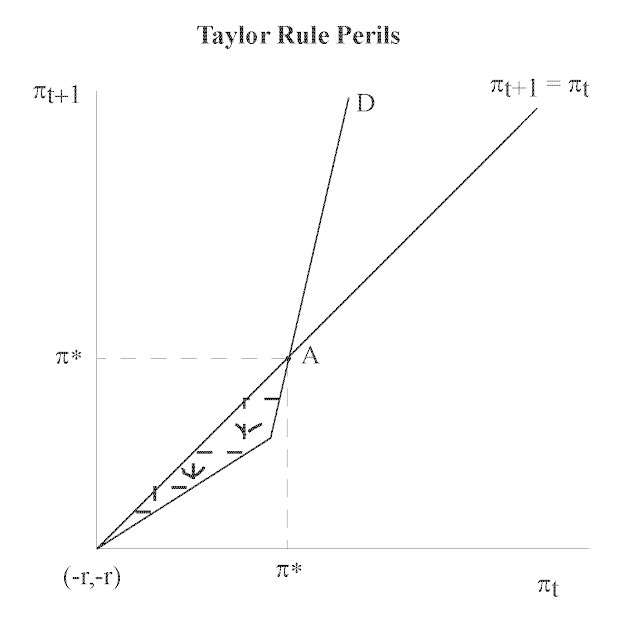 Note that the Taylor rule central banker is Neo-Fisherian if d < 0, and that this can be OK in some sense. But aggressive neo-Fisherism, i.e. d < -1 -2(a/b), is bad, as this implies that the inflation rate cycles forever without hitting the inflation target. The rule (10) specifies out-of-equilibrium behavior that kills all of the equilibria except the desired steady state. Why does this work? If the central banker sees incipient inflation in the future, he or she knows that this will tend to increase current output, increase current inflation, and increase future output, which will also increase current inflation. To nullify these effects, the central banker commits to offset this completely, if it happens, with an increase in the nominal interest rate. In equilibrium the central banker never has to carry out the threat. Maybe you think that's not plausible, but that's the nature of the model. NK adherents typically emphasize forward guidance, and that's not going to work without commitment to future actions. So, for this learning rule, inflation is determined period-by-period by the nominal interest rate - this is about as Fisherian as you can get. Thus, if conventional central bankers are basing their ideas on some model, it can't be a mainstream NK model, since increasing the nominal interest rate makes inflation go up in mainstream NK models. But don't get the idea that it's some other mainstream model they're thinking about. As the Neo-Fisherian Folk Theorem says, all the mainstream models have these properties, though some of the other implications of those models differ. For example, it's easy to show that one can get exactly the same dynamics from Alvarez, Lucas and Weber's segmented markets model. That's a model with limited participation in asset markets and a non-neutrality of money that comes from a distribution effect. Everyone in the model has fixed endowments forever, and they buy goods subject to cash-in-advance. The central bank intervenes through open market operations, but the people on the receiving end of the initial open market operation are only the financial market participants. The model was set up to deliver a liquidity effect, i.e. if money growth goes up, this increases the consumption of market participants (and decreases everyone elses's consumption), and this will reduce the real interest rate. Thus, you might think (like the NK model) that this produces the result that, if the central bank increases the nominal interest rate, then inflation will go down. But, the inflation dynamics in the Alvarez et al. segmented markets model are identical to what we worked out above. In fact, the model yields a difference equation that is identical to equation (4), though the coefficients have a different interpretation. Basically, what matters is the degree of market participation, not the degree of price stickiness - it's just a different friction. And all the other results are exactly the same. But the mechanism at work is different. The quantity theory of money holds in the segmented markets model, so what happens when the nominal interest goes up is that the central bank has to choose a path for open market operations to support that. This has to be a path for which the inflation rate is increasing over time, but at a decreasing rate. This will imply that consumption grows over time at a decreasing rate, so that the liquidity effect (a negative real interest rate effect) declines over time, and the Fisher effect increases. So, once you get it, you can form your own Neo-Fisherian support group. Moving from denial to advocacy is important. So future inflation must be greater than the inflation target. But (17) says that the central banker chooses this rule only when future inflation is less than pi**, which is less than the inflation target. So this can't be an equilibrium. I like (17), as the central banker is Neo-Fisherian - he or she kills off low inflation with a high nominal interest rate. such that, if the initial inflation rate is below this critical value, then the inflation rate goes to the inflation target in the next period and stays there. If the initial inflation rate is above the critical value, then the initial nominal interest rate is zero, and the inflation rate falls to the inflation target, and stays at the target forever. So, that's a Fisherian rule that has nice properties. Addendum 3: Here's another one. Central bank follows rule (20) if current inflation is below the inflation target. Central bank follows rule (10) if current inflation is at or above the inflation target. With inflation below the target, this implies raising the nominal interest rate to get inflation to target. With inflation at or above the target, the central bank promises to raise the nominal interest rate in response to incipient inflation. At worst, this implies one period of inflation below target in equilibrium. Well, Erdogan may just have been generally confused. Not sure he thought the problem through correctly. Haven't thought about this, but even econ 101 might give you neo-Fisherism if you do it right. Of course Econ 101 is neo-Fisherian. MPK pins down the real interest rate. And the Fisher Eqn. Full Stop. "Neo-Fisherites say that increasing interest rates increases inflation. Further, it's not like this is some radical, novel theory." It is indeed old, very old: just another form of permahawkery. Permahawks direly try to find any reason to raise rates. This is nonsense in normal times and when we are still in the worst recessions since the Great Depression and far above the Wicksellian natural rate arguing for raise increases (and the ensuing increase of unemployment) is in my book akin to a crime. I always thought that when interest rates were too low, close to zero, banks would not lend as much, since they cannot make as large a profit. Certainly slow GDP growth reflects that lack of lending at least to the real economy in the USA. So, if interest rates are raised, why wouldn't that motivate more lending, more widespread prosperity, and maybe a little more inflation? Simpler: A rate hike implies rising cost for producers operating on borrowed money: thus they are likely to rise prices (and so CPI). The overwhelming majority of modern economies is for some reason borrowing money. But none of the models shown by stephen has any of these features, which make the neo fisherian result quite unintuitive. I understand the neo fisherian result only in a ftpl framework, where higher rates reduce ability of government to pay back debt and people get rid of government debt to buy things. Without that I still find it hard to understand neo fisherism, not saying it s wrong, just unintuitive. Not being intuitive just means you don't get it. So, tell me how you think monetary policy works, and where your intuition about that comes from. Well, my intuition is the following. The cb permanently increases the nominal rate. People want to save more and spend less on goods. This should induce producers to lower prices. However, people save more and spend less only if higher nominal rate is not compensated by higher expected inflation, so a sufgiciently higher future price level can avoid the fall in today's prices, and the latter is the neo fisherian case. What I dont get is what should induce producers to raise prices over time. I am completely at a loss on this. The only idea I can have is that this happens through some form of self fullfilling effect, like people perfectly believes in the cb inflation target and so raise prices over time. If this is the reason, it is quite unintuitive. The standard intuition, I think, is that expectations are "anchored," which I take to mean exogenous. So, if the current nominal rate goes up, the real rate goes down. Further, standard intuition is that future consumption and output are exogenous in this experiment. So, if the real interest rate is higher, standard consumption-smoothing dictates that current consumption should fall. Current output is lower, and then a Phillips curve effect dictates that current inflation is lower (given anchored expectations). That's basically what's going on in (3), if you fix the second term on the right-hand side. For some reason, many people seemed convinced that this is what is going on in the NK model. But that's not correct. 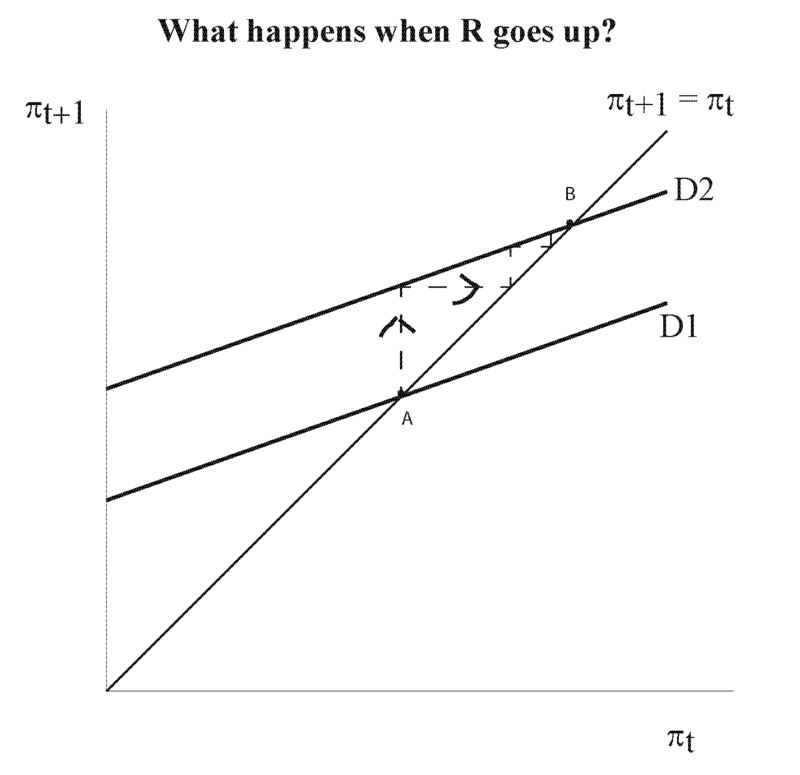 When R is raised permanently, inflation expectations are not fixed - they have to adapt to the policy. The real rate is higher alright, and that's reflected in lower consumption today than in the future, but that need not mean that current consumption goes down. It actually means that future consumption goes up. And that higher future consumption and output, working through the Phillips curve effect, is pushing up inflation over time. That's how it works in this model, anyway. "For neo-Fisherism to be right, the private sector would respond to higher interest rates by both spending less and expecting higher prices. For example, ​firms would respond to falling sales by raising prices. This doesn’t seem to be how firms and workers ​usually behave​ (there are exceptions)​. If it was, it would make central bankers’ jobs a nightmare." "It is far more persuasive that low inflation leads to lower interest rates and the reason inflation hasn’t risen is that rates should have been even lower. Risk aversion, tepid investment and fiscal austerity mean demand has been less responsive to a given interest rate. In fact, the equilibrium real rate may be negative. The Fed can’t push nominal rates below zero, so monetary policy has been too tight." So, clearly, at the time of the greatest crash, say mid 2008, inflation started to decline and lower rates were a response to that interest rate decline, not the other way around. Could you respond? Here is the blog link. What he finds "persuasive" is conventional wisdom, which is not helping anyone, including the majority of the world's central bankers, understand what is going on. I am not against raising interest rates some, because it may encourage banks to lend, if there is a little growth already. We don't want to be Europe where people are protesting against the Rothschild ECB. "the inflation rate decline preceded the interest rate decline." There are many factors that affect the inflation rate, in addition to monetary factors that are under the control of the central bank. Maybe we could eventually all agree that highly persistent/permanent shifts in central bank interest rates move inflation in the opposite direction in the short-term, Fisherian dynamics dominate in the medium/long term? Some micro-foundations? Larry Summers and the typical central bankers haven't fully absorbed the impact of rational expectations in New Keynesian analysis. Some of the Neo Fisherian analysis hasn't fully absorbed the need to relax rational expectations in policy or real world analysis (as opposed to just highlighting interesting cases/economic parables in the sense of Gibbard and Varian, 1978). Well, I wouldn't call a "highly persistent/permanent shift" short term. Indeed. Inflation numbers collapsed rather quickly after rate cuts post 2008. In that case, though, the financial crisis was driving a drop in asset prices, including the prices of commodities, so I wouldn't attribute much of that to monetary factors. Well, the GDP was being destroyed in 2007/2008. Not sure monetary stimulus could not have helped in non bubble areas where employment was destroyed even where there were no house bubble bursts. Also, question, does the Fed agree with Chris Phelan that there could be a run on the Fed if all the banks decided to lend out the excess reserves? Seems like a little lending would be better than negative interest rates if it comes to that. Saw the Phelan paper, and didn't find it compelling. Dr Williamson, interesting comment. So, to avoid potential negative nominal bond yields getting out of hand in a recession, would the Fed ever be interested in doing the Market Monetarist thing of negative IOR to spur lending? I am assuming that negative IOR can be accomplished without pushing bonds into negative territory. And, whether Phelan is right or not, I know the Fed does seem to mandate slow growth in other ways. Would you agree with that? Thanks for your time, btw. negative rate proposals usually apply just to the short end of the yield curve - typically it's the interest rate on reserves that goes negative. Janet Yellen was asked a question about negative interest on reserves, either at the last press conference, or when she talked to Congress. You should be able to find that on video. Another thing that's still not completely clear, or maybe I'm just lazy to fully do the derivations on Saturday afternoon: consider the flexible price model underlying the New Keynesian economy and assume a permanent rise in the nominal interest rate. The Fisher equation says we need to have expected inflation between now and next period. But how do we know if this comes through a rise in the price level relative to the previous level, or rather through a quick decline in prices in the current period, followed by a rebound to the same price level next period. Something in the nominal equilibrium selection, since a cashless/money as pure numeraire flex price economy only determines expected inflation, not the price level? I think this matters in getting the results for example in Cochrane's analysis, where inflation rises even with sticky prices. If we selected an equilibrium where instead with flexible prices prices first drop (i.e you have deflation relative to the initial period), providing room for expected inflation next period, then a local to friction-less sticky price equilibrium with rational expectations should also have short-term lower inflation followed by higher inflation. What selects the price level here (similar questions arise in open economy models where the UIRP holds: you often get an initial exchange rate depreciation that allows for a future appreciation in response to an interest rate cut. If you prolong the initial depreciation a bit due to short term deviation from rational expectations, you get a carry trade). If we have a cashless model in which prices are fully flexible, then we're just adding an irrelevant numeraire to the model. Then "monetary policy" is also irrelevant. But, you could do simple monetary models with no sticky prices, and work out inflation dynamics under different Taylor rules. Roughly, the properties will be the same as what I worked out here. What about models in which the fiscal authority responds to higher interest rates by reducing its deficits over the medium and long term? 1) "tight money" causes a short-term contraction due to frictions such as sticky prices. 2) The threat of higher interest rates induces a fiscal contraction over the medium/long term. 3) Expectations of lower inflation due to the fiscal contraction cause the rate of inflation to go back down again, which is then accommodated by the central bank lowering its interest rate again. Once we include fiscal policy and start thinking about the fiscal/monetary interaction, lots of things can happen. Sufficiently rich tax policy and the zero lower bound is irrelevant, for example, in NK models. I think you are at stage 1 of understanding the NK model. Anchored inflation expectations doesn't mean exogenous. In fact, you can solve the NK model with a forward looking Phillips curve paper and pencil even without abstracting from expected inflation. Importantly, you can solve for expected inflation. You will see that expected inflation does move. Anchored inflation expectations means that IN THE LONG RUN inflation expectations converge to the inflation target. More constructively, you basic misunderstanding is that you have the steady state implication of (6) wrong. Congress gives the Fed an inflation target. What anchors inflation expectations is the credibility of the Fed, and the coordination of beliefs around that target. Equation (3) determines the nominal interest rate that supports that inflation rate. For example, if the target is zero, the nominal rate has to be equal to the real rate, which is just the inverse of the individual discount factor. By the way, using the linearized version of the model as if those were levels is also misleading. "you basic misunderstanding is that you have the steady state implication of (6) wrong..."
I'd say you have it wrong. Congress gives the Fed some vague instructions about what it is supposed to do, and the Fed has interpreted that as a 2% inflation target and "maximum employment." In any case, it's not the inflation target that determines long-run inflation expectations, it's the long run nominal interest rate, in this model. That's what (6) and (7) say. But, given an inflation target, the question is: given this model, how do you deliver it? Addendum #3 is in fact an optimal rule, I'm convinced. Given this rule, the central bank hits its inflation target in every period but the first (as in this model, the central bank is essentially stuck with first period inflation). Inflation expectations are indeed then anchored at the inflation target forever. But, if the central bank follows a conventional Taylor-principle rule, expectations become "unanchored" in the sense that, for example, the nominal interest rate can go to the ZLB and stay there. When inflation expectations become anchored again, they are anchored at a low anticipated inflation rate. If the central bank is claiming that it can achieve its inflation target by staying at the ZLB, then it's lost all credibility. "By the way, using the linearized version of the model as if those were levels is also misleading." In the deterministic version of the model, (1) is literally what you get when you take logs on either side of the Euler equation. So, it's not an approximation. The Phillips curve is whatever it is. Nothing misleading at all. You're right that the Fed has interpreted 2% as the inflation target, but the mandate is to achieve price stability and maximum employment. No interpretation there. And in many other countries the inflation target is assigned by the government, without any interpretation from the central bank. I continue to disagree that (6) and (7) say that the nominal interest rate determines inflation expectations. The non-linear NK has a continuum of steady states indexed by the inflation rate. You can show that zero inflation is optimal in certain circumstances, but there's nothing that says that the interest rate pins down inflation. In fact, you can solve for the optimal inflation rate without any reference to the interest rate! Maybe you are searching for a better model of credibility, and you may not like the assumption of the NK model. Fine. But I think the Neo-Fisherian interpretation you are spinning on the model is just wrong. "...the mandate is to achieve price stability and maximum employment. No interpretation there." Of course there is. Price stability is vague enough, but maximum employment is even more so. You can interpret that in many ways. "...in many other countries the inflation target is assigned by the government..."
Not quite correct. Usually there's an agreement between government and central bank - e.g. Canada or New Zealand. "The non-linear NK has a continuum of steady states indexed by the inflation rate." "there's nothing that says that the interest rate pins down inflation." There is something. It's the Euler equation ("IS curve") that pins it down. "how many more years of zero interest rates and inflation expectations at 2%"
By some measures, inflation expectations are well below 2%. And for those who still think that inflation will be 2% in the future, keep watching actual inflation, and adapt. Not an interpretation. These are the implications of the model. My concern is that some of the results seem to be driven by transversality conditions that provide the additional equations necessary to close the system. For example, that's how you get (6) from (1) (by imposing non-explosive inflation). Similarly, equilibria are ignored if they lead to infinite output in finite time. Now, if economic agents can tell when such a condition is violated and realize that this cannot be an equilibrium then this common assumption would be harmless. But I don't think this happens in real life. Usually there is some mechanism that kicks in if the economy is an unsustainable trajectory, and if it takes a long time until that mechanism kicks in then people may not be aware that some equilibria have bizarre properties, in which case policy could work in ways very different from what the models predict. 1. (6) is just a property of a steady state. Doesn't say anything about the set of equilibria. 2. It's correct that to get (1), you need a condition that prevents ponzi schemes on the part of the agents in the model. 3. On infinite output, if you impose a condition that bounds labor supply, so that output must be finite, I think you can still have inflation running off to infinity in equilibrium. You have to alter (2), though, to account for that. None of that alters what I discuss above. Basically, the standard policy rules people talk about have bad properties, but neo-Fisherian rules have good properties, and there are many ways in which neo-Fisherian rules give the economy Fisherian properties. Hmm, on the first point, it is because a steady-state is defined as pi(t) = pi(t-1), right? But why need that be the case? I understood that it is because otherwise you end up with ever increasing or decreasing inflation, which violates some boundary condition. Or is there some other reason? Anyway, if the results are robust then that certainly strengthens the argument. But I need to think more about this. Yes, in a steady state, output and inflation are constant. There can be plenty of non-steady state equilibria, though. Under some policy rules, those non-steady steady equilibria will converge to a steady state. But there are some cases, for example in the Taylor rule perils chart, with d > 1, where there are equilibria for which inflation grows without bound. The simple case supposes that (2) always holds, which has output exploding. That's not very attractive, so you can modify it. Indeed, you can get the same dynamics if you just assume y(t) fixed (cash-in-advance endowment economy for example), instead of (2). That doesn't violate any boundary condition. You can get these types of hyperinflationary equilibria in simple monetary models. For example, overlapping generations models of money can have many equilibria that converge in the limit to valueless money.